When it comes to using plants on the vertical spaces of buildings to help clean the air, Taipei leads the way. One of the first green wall concepts in Asia was built by companies that specialized in sustainable waste disposal and green energy and their vertical garden helped to camouflage a landfill site. Since then, the architecture has soared! The smog-eating Tao Zhu Tower, a twisting double helix of 40 luxury condos is the latest. Its 23,000 trees and shrubs will absorb 130 tons of carbon dioxide per year. Studies indicate that hospitals with living walls have faster patient recovery rates, office spaces have fewer employee complaints and fewer sick days, and homes are more peaceful and tranquil. 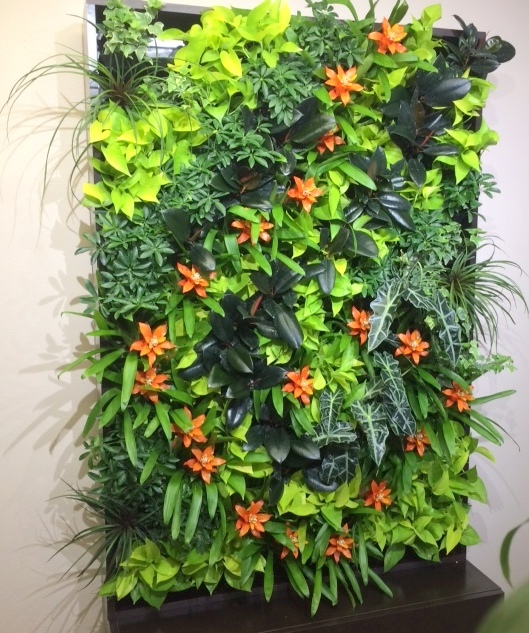 Finally, here’s the living wall we have in our reception area at Plantique. Come visit!